As a producer, distributor or marketer of chemical products, it is essential to understand the regulations related to warehousing and transportation of items classified as hazmat. But what makes a product considered hazmat? Hazardous materials are any material that can cause harm to humans, animals or the environment. These materials can be in liquid, solid or gaseous form. 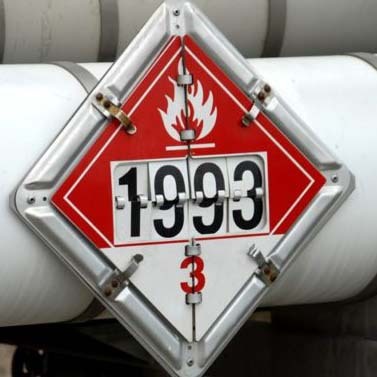 Almost all hazardous material regulation fall under the jurisdiction of one of three federal agencies; the US Environmental Protection Agency (EPA), the US Occupational Safety and Health Administration (OSHA), and the US Department of Transportation (DOT). Each bureaucracy has its definition of hazardous materials. The EPA regulations relate to what kind and how much materials can be released into the air and water and also covers accidental spills and discharges. OSHA’s rules pertain specifically to human exposure in the workplace to chemicals and materials and defined limits to these exposures to protect worker health and safety. DOT regulations govern what substances and what amounts are transported by road, air and maritime vessel. The rules for these agencies are defined within the Code of Federal Regulations (CFR). The rules are lengthy and at times inscrutable, but if you have time and motivation, you can access them online at the government website: https://www.ecfr.gov. Several other standards groups define testing protocols for the testing for flammability of substances such as ISO, UL, and IEC to name a few. Oxidizers present a hazmat risk because of their ability to have a chemical reaction with other materials to catch on fire. Examples of these are pure forms of pool chemicals, hydrogen peroxide, fertilizers, and specific metal cleaners. Acute Toxicity – Absolute degree of being poisonous. Subchronic Toxicity – Effects of repeated exposure to toxins over an extended period. Carcinogenicity – The effect of the toxin to convert healthy cells into cancerous cells. Reproductive Toxicity – Effect on female reproductive systems and the baby. Dermal Toxicity – Toxic effect on the skin to cause irritation or inflammation. Ocular Toxicity – Effect on the eyes. Corrosive substances can cause irritation and damage to the skin. Corrosive substances will have either a high pH (14) or low pH (1) level. High pH materials would include things like sodium hydroxide (pH 13), and a low pH example would be the hydrochloric acid with a pH of 1 at a 40% concentration. Household items considered corrosives would be; drain cleaner, ammonia, carpet shampoo, dishwasher detergent, and bug and tar remover. There are several testing methods for the degree of corrosiveness defined by ASTM and other standards organizations. Hazmat materials sometimes can be shipped despite being hazmat due to the small quantity and the lower risk of harm due to the small amount. UPS and other shippers have defined these instances and will ship hazmat items. See link. Potentially hazardous materials will be categorized into one of the nine classes. Materials should either be tested or an SDS sheet referenced on the substance to determine its characteristics. Once this is identified, then the CFR should be referenced to identify the relevant regulation.